Tony Andreu's second-half penalty took Dundee United level on points with Ladbrokes Championship leaders Hibernian after a 1-0 win but Tannadice keeper Cammy Bell was also a spot-kick hero. After a dull first half, home number one Bell, who made three first-half penalty saves to help the Taysiders beat Dunfermline Athletic in September, pushed away Martin Boyle's spot-kick in the 55th minute. The save became all the more significant when Hibs defender Liam Fontaine upended substitute Simon Murray in the 73rd minute and Andreu made no mistake from 12 yards. United are now unbeaten in 11 matches in all competitions and are behind the Hibees on a goal difference of six as the title race tightened up. Before the match there was a minute's silence for the victims of the Colombian air disaster involving Brazilian side Chapecoense. Amid a frantic start, Blair Spittal had to go off for treatment to a face knock leaving the home side with 10 men for around eight minutes before the United midfielder came back on. The Taysiders soon got back into their rhythm and five minutes later Andreu's effort from 35 yards just cleared the Hibs crossbar. His powerful drive from just short of that distance in the 27th minute was even closer, missing Ofir Marciano's right-hand post by inches. However, it was far from exciting fare. The first-half finished with Andreu - who had seen Hibs defender Darren McGregor block another effort earlier - miss the target with a drive. The start to the second half was more in keeping with pre-match expectations. Hibs passed up the chance to take the lead, moments after keeper Marciano blocked a powerful shot from United midfielder Charlie Telfer. 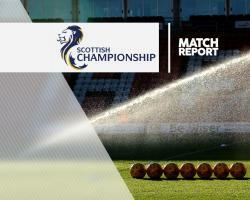 The visitors raced up the park and when defender Lewis Toshney tripped Boyle inside the box referee Bobby Madden pointed to the spot but Bell guessed right to save an unconvincing spot-kick. At last there was some drama. A melee involving players from both sides moments later ended with United midfielder Willo Flood and Hibs striker Grant Holt pick up a yellow card. The home side, growing in belief, took their chance from the spot when Murray's mazy run into the box was ended by Fontaine, with Andreu stroking the spot-kick into the corner with some confidence. Hibs fought back but found the home side determined to keep their goal intact and their title aspirations very much alive.